A good or a bad idea, you decide? The Mock Suns made a video for one of their songs in which they consume cream colored candy hard shell masks of their own faces filled with a red gooey syrup that doubles for blood. The band then hid 100 CDs all over their city of Philadelphia with redemption codes on them. The first 25 people to turn them in were rewarded with one of these edible custom candy faces. More pictures of this package can be found here. 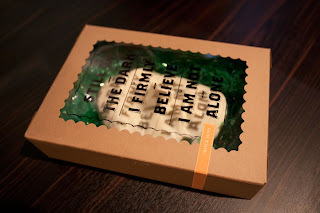 This clever marketing concept neither made me like their music or inspire me to eat such a creepy confectionery item but I applaud the creativity behind the promotion of their record and it did inspire me enough to post about them here. While I wouldn't buy one of their records or eat one of the unappetizing candy masks, I think this band has a future in advertising. Candy Cannibals would be a good name for a band!